Go to your products dashboard and click Add a product, then Digital Product or Physical Product, then Subscription. Give your subscription a name and a default payment option (monthly, annually, semi-annually, annually) and click Next. On the Options tab of your product, you can establish whether or not your subscription is fixed-term, or continues until the subscription is either manually cancelled by you or your customer. 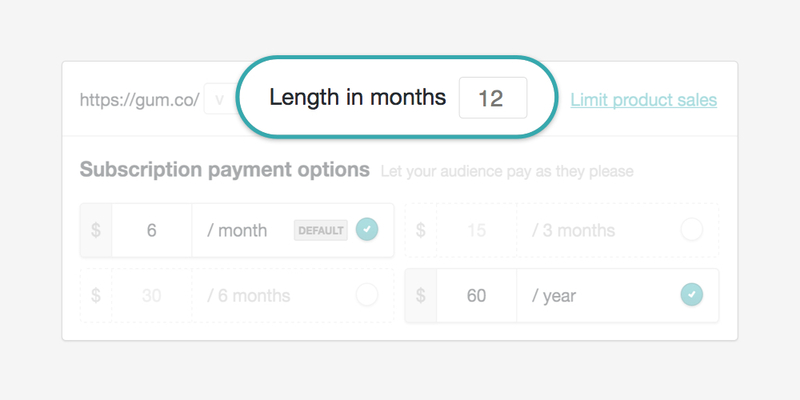 Simply type a number into the box marked Length in months to set an end date on the subscription. Please note that the number you enter must be a multiple of the payment options you are offering on the product. So, if you are offering a yearly payment option, you can't set the subscription to end after 13 months. Make sense? Let us know if you have questions. After a customer's subscription has automatically ended, they will still be able to view all of their updates in their library. This is a terrific feature to take advantage of if you are selling e-courses on Gumroad, or annual magazine subscriptions.